I keep seeing these McDonald's billboards around town advertising their local selections. Yesterday it was an ad that said, "Grown in Washington, Dipped in Ballard", referring to their apples (Ballard is a neighborhood in Seattle where I live). 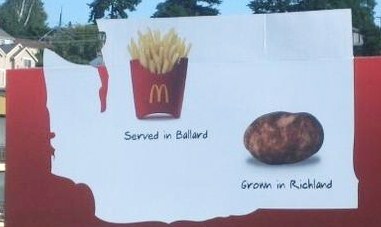 A few weeks ago, it was "Served in Ballard, Grown in Richland", regarding the potatoes for their fries. Of course, when you are driving down the freeway, you don't notice the fine print that says, "Participation and duration may vary." A McDonald's spokesperson stated that 95 percent of the fries served in the Northwest are grown on farms in Washington, Idaho, or Oregon, 95 percent of the fish in their sandwiches comes from Alaskan waters where the Seattle fleet fishes and 88 percent of the apples come from the Treetop Company which buys apples from Washington State orchards. It economically makes sense for the company to use local resources and these statistics haven't changed in years. They are just now promoting it, but it makes it sound like as if they are just now going out of their way to choose local. The impression is that they are doing it to support local business or to reduce carbon emissions. But, it's just good for business. According to some, the recent local marketing efforts in the food-service sector are all about "removing the impression that they're taking money away from the 'mom and pop' shop that doesn't really exist." I wonder if they use the same potatoes, fish and apples nationwide and we just happen to be "local" to those resources. So, should it matter that they are promoting the local angle? Isn't that what it's all about? Or is it greenwashing? Do you have McDonald's "local" billboards in your area? We don't have "local" billboards in our area (Mosgiel, New Zealand) because we fought off the new McDonalds - and WON! A new McDonalds was scheduled to foul our little town (pop. 10,000), right opposite the local playground. You can just imagine how tough it would have been for parents to say no to their kids demanding McJunk after they played at the park. But we fought it off. After tightening local restrictions on the height of signage, the opening hours, the noise levels, brightness of lights etc. McDonalds have decided NOT to go ahead with their plans for the new "restaurant". We're over the moon - cautiously so. Because we don't expect they'll give up that easy. I think they'll make another attempt to build here. It's just a matter of when, even though the whole community (apart from the people running the thing) don't want it - and have said so. McDonalds isn't local in our area, and we don't ever want it to be! So I guess even though they're localwashing around the world, there *are* communities willing to fight the McTrashing of our towns. my understanding from what I had read is that it is a NW promotion and the fact is they have always bought these items locally- just now wish to come out of the closet about it so to speak. So I vote greenwashing. Why? Because a french frie is still a french fry whether it comes from walla walla or Douth Florida,it still clogs the arteries, and I am sorry, local is great but that aint gonna make Mickey D's any healthier. 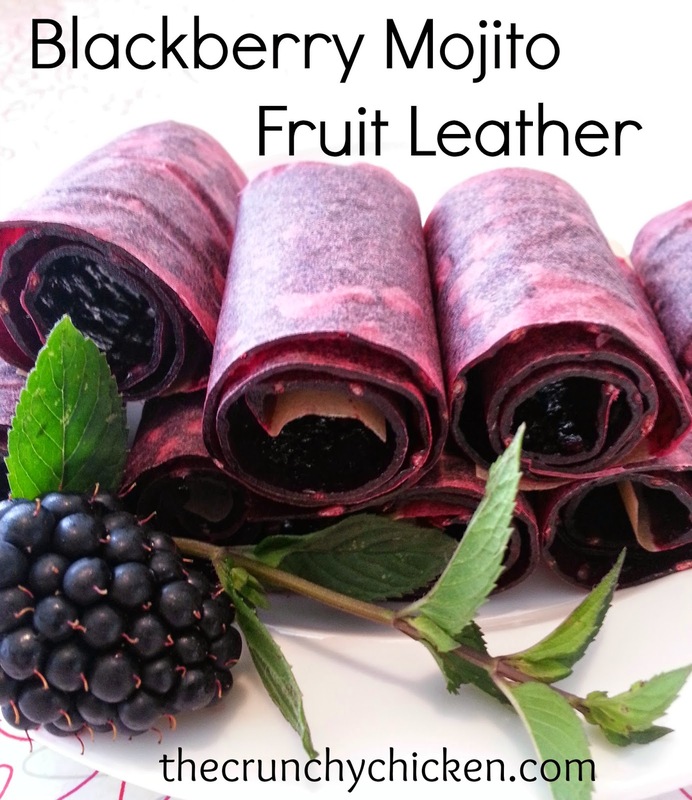 Funy thing is they all now selling these real fruit smoothies, but if ask for a specific kind they don't have it because it comes to them already prepared practically in specefic varities! Wow now that real fresh fruit isn't it? I've never seen anything like that and I live in upstate NY. I suspect that most of our McD's apples, potatoes, and fish come from your neck of the woods too. So I would say they are not making any effort to buy local; they are just taking advantage of a current food fad by promoting something that has always been true in your area. Honestly... it would make no difference to me if they bought local or not. I don't like their food and won't eat there unless I have no other choice. I haven't seen those ads in the Mid-Atlantic. Then again... don't watch conventional TV and don't have a ton of billboards (any?) on my daily commute. No Local Billboards in Western New York. I don't know where McD's apples or potatoes come from, but I doubt its local for us. Fish certainly isn't local. Maybe the lettuce is local. No local billboards here in Texas. Like others have said though, does it matter if they are grown locally or not? Where these things processed and forzen? And does location matter when in the end all you are gitting is a heartattack in a box? No billboards that I have seen here in Ottawa, Ontario. But I think it's a bunch of marketing BS anyway...And even if it wasn't I would never eat there. I haven't seen any (D.C.) but I wouldn't consider myself a good candidate to notice. No billboards in Il. I think they are just preaching locality where they *may* be local, but the rest of the country gets their yucky gross produce shipped in. Although I'm pretty sure the gross cornfed cow-lot meat would be local to us...lol. I saw them north of Seattle and instantly thought greenwashing. I'm sure that if they do get apples or potatoes from WA state they get thrown in the hopper with all of the other apples or potatoes from everywhere else at some centralized processing plant. There is nothing McDonalds could do to that would make me think they are a responsible, local, and fair trade company. Haven't seen anything here in this part of Texas. And yes, this is total greenwash. Buying local makes some business sense, to the extent that there is something local to buy in the massive bulk that McD requires. That won't be the case in most areas. With energy still very cheap, it makes better business sense to buy cheap beef from Argentina, and produce from Ecquador and ship it here than it does to buy local. But on a positive note, I am glad to see corporations finally getting the message that "green" is sells, which tells me that markets are valuing "green." Maybe soon they will actually start to incorporate sustainable practices into their business models. Haven't seen any of these is Canada. They have though been trumpeting the fact that they use Canadian beef. This is a little ridiculous since we're so large that depending on where you are the food miles might even be higher if they are using beef from out of the province or even the province you are in. I can just imagine the arguments in my future when my little girl is old enough to buy into the advertising campaigns. We're starting to think we might cancel the satellite and just rely on the internet where we can edit what she sees but how realistic is the really? "So, should it matter that they are promoting the local angle? Isn't that what it's all about? Or is it greenwashing? Do you have McDonald's "local" billboards in your area"
Anyway - to address the question: No, we do not have any billboards advertising anything that McDonald's sells in our area. I live in Prince Edward Island, Canada, and I know, at one time, they were using our local potatoes for their french fries - not just here but in many other places as well. This was a boon to potato farmers trying to find markets for their produce. They also serve, in the summer, a McLobster Burger. If I eat anything at McDonald's (and I rarely do because I am celiac so rarely eat anywhere but at home or at family or friends' homes), I eat their fries because they are "safe" - i.e. gluten free. The oil in which they are cooked is not cross contaminated. If they really do use local produce - is that not a good thing, regardless of whether you eat there or not? Sometimes, it seems, we just look for the bad in everything. As for "greenwashing" - well, being a journalist for as long as I have, I am skeptical about most things. However, I try to focus on the positive and not the negative. Encouragement goes a lot farther than criticism. I haven't seen the local billboards here. If they or anyone else is buying local because it makes good business sense, then what's the harm in doing buying local even if the green aspects are further down the list that I would like as long as they ARE doing it? Most of those stores are owned by local people as afranchise. They might get away with honestly claiming to be locally owned as well. Most Buy Local folks tend to think that local food is automatically healthy food. Not really you can buy locally made junk food if that's what you want to eat. I think it's a good thing that they are investing "local" economies. They could very easily get their produce shipped from overseas, so I see it as a positive that they're investing in American products, thus creating American industry in this sucky economy. But as far as being processed locally? That's a question to be asked. No local stuff in Minnesota. You're just in the right place. No billboards, No mcdonalds here! I don't consider anything they sell food, and haven't set foot in one for almost 15 years (and that was in Estonia to use the washroom). I just did a major round trip shopping trip in a loop here in CT today - nary a "local" McD's sign. I'd vote that it's greenwashing in an area that really wants to be green. They buy local to you because, well, the major commercial producing areas ARE local to you for those products. Everything is local to somewhere after all. All I can think of McDs ever doing local around here is promoting their sad attempt at lobster rolls and trying promote their carrying of Newman's Own Coffee by playing on New England specific vocabulary. But both were aimed at being local favorites. We don't have local McD's billboards here yet. BUT, we do have displays in Walmart with "Local produce" signs. Not sure I believe it, but it's about time. I don't usually shop there, but an Arkansas company who just NOW sells Arkansas produce? Thank you Olivia you took the words right out of my mouth. Of course it matters if McDonalds decides to go as local as they can, even if I hate them with a bitter, deathlike passion. Think of the billions and billions of food miles that could be saved if they were in earnest. To take another example, I was thrilled when Wal Mart started selling organic produce, even though I would rather lose a tooth than shop there. The potential impact of small moves by McD or W-M is thousands of times the impact I could have by, oh, say, joining a sailboat powered CSA. But one is cool and the other is uncool right? That's what matters, right? Sheesh, gimme a break. I think I deserve one today. I don't have a problem with any corporation advertising that they use "local" in the locality where that is local as long as they don't extend that local advertising to areas where they are non-local. I did line work in food processing plants when I was in college during the summer -- a lot of food products are processed local to the food source. Where I live now, a lot of the farmer's market farmers exist, because they used to grow vegetables for Campbell's when Campbell's canned its soup in this area. We don't have the local billboards here in Houston (that I've seen). Our billboards are about using all your taste buds and stuff. I think it's greenwashing. I've never seen these billboards (they're illegal where I live) and I rarely see any other advertising. I really dont think that sort of advertising would fly here anyway. We have a few McDonalds here but they're more for the tourists. Sadly I think we would have a hard time getting rid of them as anything that will keep the tourists happy stays.